Let go, and let love in! Stop trying so hard. It’s right there underneath your nose. Pop culture provides a variety of ways of saying that the good stuff is very likely the stuff that you aren’t trying to see. Which makes me wonder about the value of the shiny, big, obvious stuff. This could spin off into a yogic philosophy discussion about transcendence… but I’ll try to keep it here in the present and tangible. Yesterday I discovered that some enterprising people in Decorah, Iowa have trained a webcam onto a bald eagle nest, which featured two eaglets and an unhatched egg, in addition to one parent eagle. For archiving purposes, I’m linking to this great story that the fabulous birding blogger Sharon Stiteler posted recently, which contains the webcam URL as well as a story she put together around some specific behavior of the eagle parents. That cam is mesmerizing. I succumbed to its pull, and when I finally emerged several minutes later, I was reminded of a scene from a so-so movie about my generation’s experience in their 20s, “Singles.” At one point in the film, Matt Dillon and what appears to be all of Pearl Jam are sitting in front of a TV, transfixed on some footage of … bees, I think it was. The picture was one of slacker behavior, but can you blame them for being fascinated with something a camera is focused on, exclusively? Bald eagles are magnificent creatures, though some people are quick to give them the bum rap of being scavengers who munch on already-dead animals. Their features are so bold, simple and rough: prehistoric. They are gifted with flight, and armed with dangerous weaponry. They are easy to spot: they have magnificent and wide wingspans, they don’t teeter in flight like turkey vultures, and the white heads of the mature ones really stand out. We see them pretty often, on my walks, drives, or bike rides to and from work, and elsewhere in the twin cities, usually in flight. All I witnessed this morning on the webcam was an adult eagle providing warmth to the two eaglets, and letting the camera see them every once in awhile. Periodically, the adult would re-nestle him/herself, appearing to be seeking a more warming arrangement for the babies. We don’t often get to see animals -especially ones we mostly see when they are using their sharp beak or talons to turn life into food – nurturing their young, like this. It would be easy to just note that they seem almost human in their behavior, but is that really what I’m noticing? If I saw human friends doing same, I’d likely bring more baggage into the picture: remark on the cute baby clothes, marvel at the glisten of the drool, and ask the mom questions. That webcam and those wild animals strip the situation down into something beautifully, brutally simple: natural selection will likely keep all of those eaglets from surviving, and I can’t do much about it. The eaglet is truly helpless. 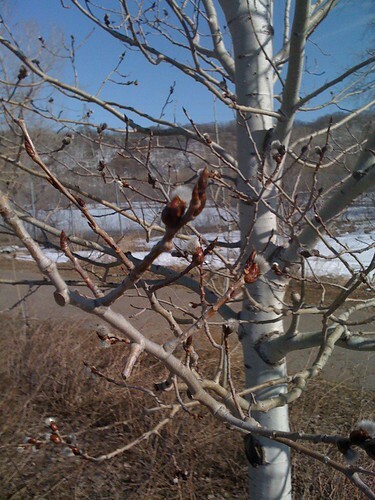 Pictured is a catkin on one of the trees along the bike path that approaches my workplace. Lately I’ve been walking to work more often, in an effort to get my training in, for the charity walk I’m doing in June. I’ve walked those paths during most months of the year, many times over, and yet seeing these furry catkins every year surprises me. It’s the only month of the year when I wonder what kind of tree those catkins are sprouting from. 11 months of the year, it really doesn’t matter what kind of trees they are: they just blend in with all the other grey or green. But maybe it’s most important that I see, in that one catkinned month, that symbol of rebirth and the cycle of life. This year, I decided to join my husband and his mom in the charity walk, after 4 years of supporting them from the sidelines. My sister-in-law Jenny took her own life almost five years ago. It took me awhile to be ready to talk a little about depression and suicide, and in the next breath (or typed word), to ask for support in the form of talking with me, and/or donating money to AFSP. But now that I have, I am so touched by the thoughtful actions of my friends and family, in response. I shouldn’t be surprised, but I am. Maybe it was just high time that I pick a cause to care about, and start talking with people.